Somehow we stumbled upon one of our new favorite values wines: Marietta Cellars Old Vine Red Lot #44. Located in Sonoma, Marietta Cellars specializes in Zinfandel, Petite Sirah, and Cabernet Sauvignon. Each year the winery creates a proprietary blend consisting of Zinfandel, Petite Sirah and Carignane and lesser amounts of Cabernet and Syrah. The current version, Old Vine Red Lot #44 is awesome - blackberry aroma - slightly spicy - but with a smooth, almost buttery finish. And priced under $15 it's a bargain. Over Thanksgiving we were asked by several family and friends if we had any good wine gift ideas. I decided to compile a list and post for anyone interested. My basic philosophy is to give something a little different; and you can find good wines for less than $15. For instance, why not try an Argentinian Alamos 2006 Malbec, a Spanish Mano a Mano 2005 La Mancha, a South African Beyerskloof 2006 Pinotage, or an Oregon Bridgeview 2004 Black Beauty Syrah. For whites or rose try an Austrian Velt. one 2005 Gruner Veltliner, an Italian Falesco 2004 Vitiano Bianco, or a Washington Chateau Ste. Michelle 2006 Neillie's Garden Dry Rose. I also like giving dessert wines, although you will have to splurge a bit more. Try the California Quady 2005 Elysium Black Muscat, Hungarian Royal Tokaji Wine Company 2000 Red Label, or the Canadian Inniskillin 2006 Riesling Icewine. For those looking for accessories the Riedel 'O' Series stemless wine glasses are becoming more popular. We've been using a similar style European wine tumbler for years. And everyone needs a proficient corkscrew, we use both the Rabbit 6-Piece Wine Corkscrew and the Insta-pull Lever Corkscrew. Finally CelebrationCellars.com provides many gift ideas including personalized wine labels and celebrity sketches. I hope this list helps. * Cabernet Sauvignon 2005 - Deep royal purple, showing herbal and black olive flavors backed up nicely by currants and wild berries. Soft tannins and good balance make the wine fun to drink. * Merlot 2005 - Medium bodied, with soft tannins and generous berry and black cherry fruits; very pleasant. * Chardonnay 2006 - Light gold, medium bodied, with citrus and tropical fruits on a lightly earthy background. Good balancing acidity keeps the wine lively and fruity. The labels depict Jesus' baptism by John the Baptist in the Jordan River and his walking on the Sea of Galilee. Haroz Vintners has received mostly positive reviews for simply producing the wines; while some believe the idea is distasteful. The wines are available online and at several retail outlets in selected states. Check their website for locations. I look forward to giving the wines a try, particularly as Israeli wines improve in quality. 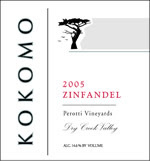 We have been drinking several different Zinfandel wines lately and our favorite has been the 2005 Zinfandel, Perotti Vineyard, Dry Creek Valley from Kokomo Winery. This three year old Sonoma Valley winery specializes in single vineyard wines, particularly Sirah, Cabernet Sauvignon, and of course, Zinfandel. The Perotti Vineyards Zinfandel was fermented in French & American oak after harvesting from the famed third generation vineyard. This wine is pure Zinfandel - a raspberry forward flavor and a spicy complex finish. And the wine is reasonably priced at $22. Today we traveled out to the beautiful rolling hills of Virginia horse country to visit another of the state's newest wineries: Miracle Valley Vineyard and Winery. The winery and vineyard are located on a former cattle pasture and the tasting room is situated in a hundred and twenty five year old restored farm house. Its always enjoyable driving through country roads in Fauquier County and driving to Miracle Valley is no exception - even though it is located only a few miles from Route 66. The Cunningham family have created a warm environment by providing both a front patio and back deck - which overlooks the catfish stocked pond. Plus, the grounds and farm house were still decorated for Halloween which provided an additional cosy atmosphere. To learn about the inspiration for Miracle Valley Vineyard, you can read this excellent article at the Fauquier Times-Democrat. Miracle Valley produces wines from traditional vinifera grapes and their red wines are classic Bordeaux. The 2005 Cabernet Franc is medium bodied - very fruit forward and a smooth finish. This wine joins the crowded competition among quality Virginia Cabernet Franc. The 2006 Merlot is full bodied with a strong berry flavor and a long spicy finish. This was our favorite red, but the wine maker's favorite is the 2006 Cabernet Sauvignon. This wine is aged 11 months in American oak that produces a strong fruity bouquet and a very spicy finish. Miracle Valley currently offers three Chardonnay wines. The 2006 Chardonnay is fermented and aged in stainless steel, which produces a fresh crisp wine with nice acidity and citrus flavors. There are two 2006 Reserve Chardonnay wines, one fermented and aged in Hungarian oak and the other fermented in stainless steel, then aged in American oak. The later is spicier and more complex - which made it our favorite of their chardonnay. The final white wine is their Sweet Michelle - but don't let the name fool you. This is more of a semi-dry wine at 2% residual sugar and made from one of our favorite grapes: Rkatsiteli. It has the familiar spicy flavor and a somewhat dry finish. For those looking for something different, this is it. This next Sunday on November 11th, Miracle Valley is hosting a children's fishing tournament from 1:00-3:00. We will have to wait until the Spring for our next visit - perhaps when their Viognier will be ready for sale. Recently a family member inquired if I had read Ellen Crosby's Merlot Murders: A Wine Country Mystery. She had enjoyed reading about the various places in Virginia that Ms. Crosby had incorporated in her book. I had first learned of the Merlot Murders while visiting Swedenburg Estate Vineyard, where Ms. Crosby was a frequent visitor researching winemaking and the Virginia wine industry. A few months ago, Swedenburg hosted a book signing for her next book: Chardonnay Charade: A Wine Country Mystery. As you may recall, Juanita Swedenburg was the lead litigant in the Supreme Court's decision to force states to treat out of state wineries the same as in state wineries. Look for the December issue of the Virginia Wine Lover Magazine where Ms. Crosby will post a tribute to Mrs. Swedenburg as she "writes about her memories of Juanita Swedenburg and her contributions to the novel."